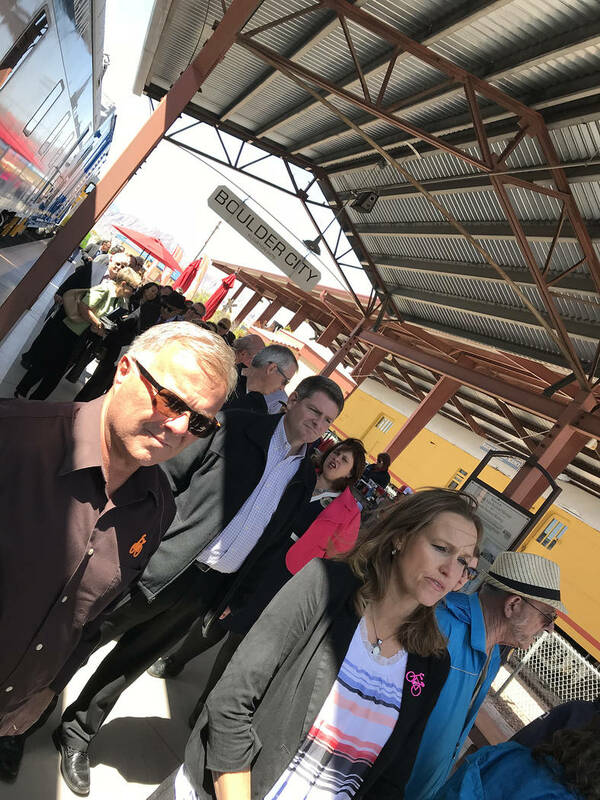 For the first time in 30 years, Boulder City and Henderson are connected by the railroad, which is providing more opportunities for residents and tourists. Mark Damon/Las Vegas News Bureau Nevada Gov. 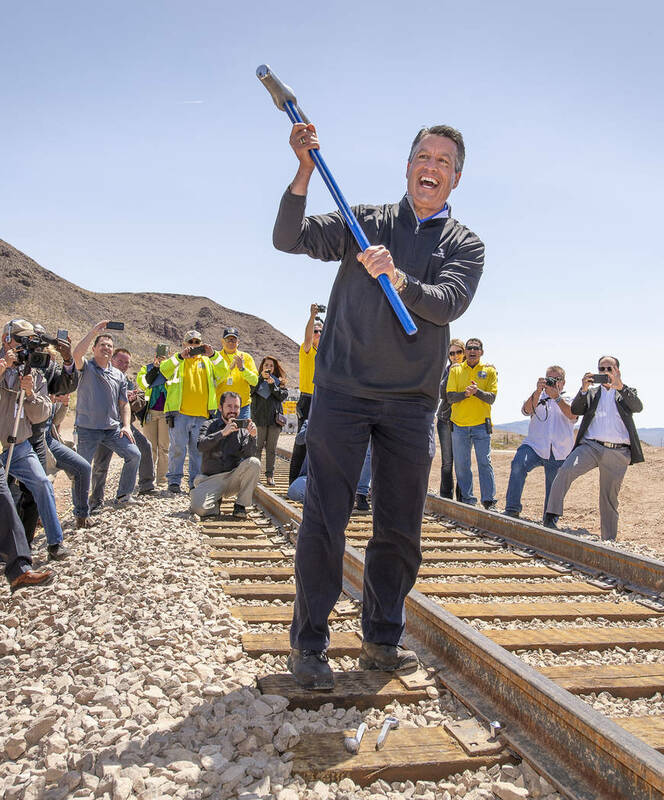 Brian Sandoval hoists the hammer after driving the "silver" spike in the Final Spike ceremony as the Nevada State Railroad Museum in Boulder City celebrates the reconnection of the Nevada Southern Railway between Boulder City and Henderson on Friday. 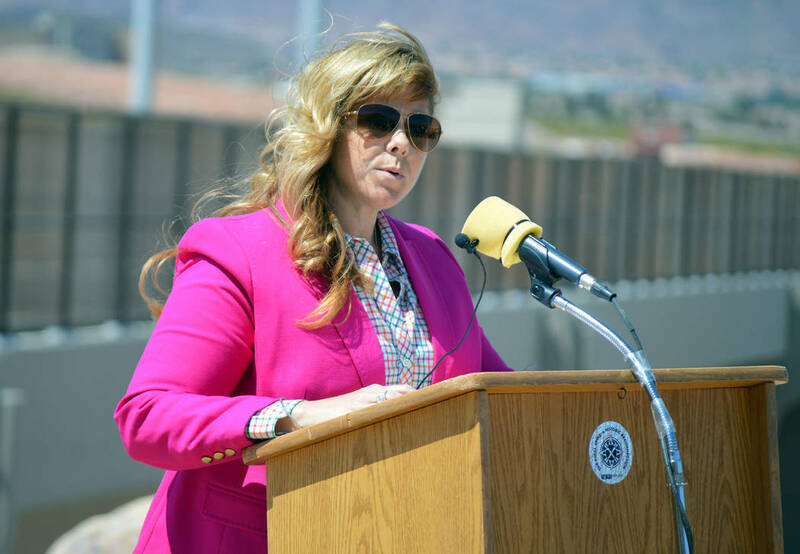 Celia Shortt Goodyear/Boulder City Review Nevada Gov. 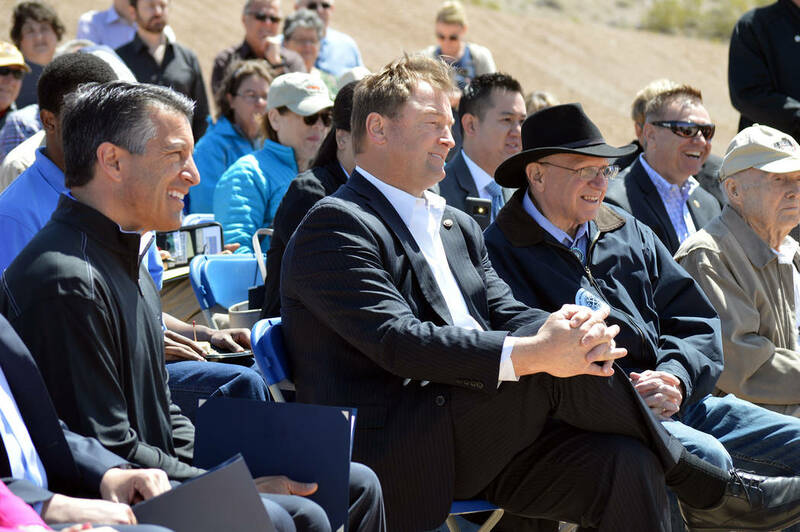 Brian Sandoval, left, U.S Sen. Dean Heller, middle, and Nevada Sen. Joe Hardy listen to a presentation during The Final Spike - A Historic Reconnection on Friday, April 13, 2018. The event celebrated the reconnection of Henderson and Boulder City by railroad. 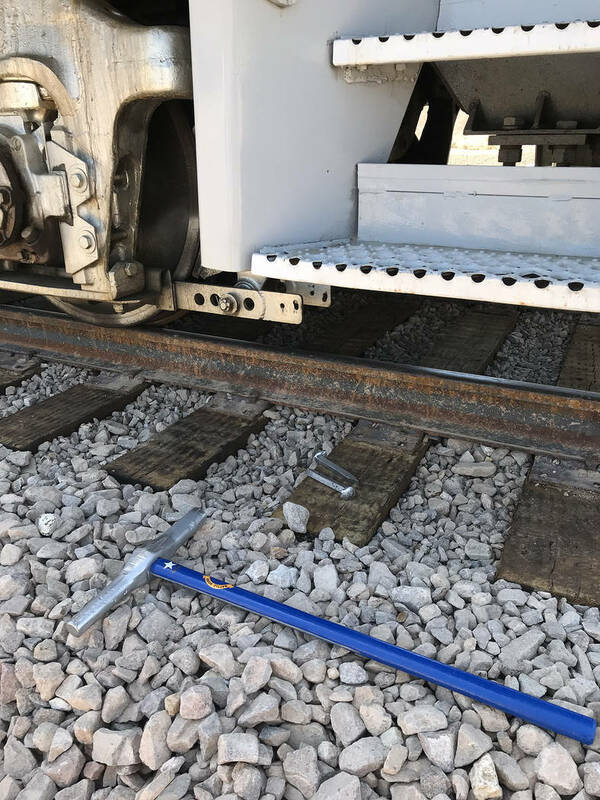 Hali Bernstein Saylor/Boulder City Review A special Nevada themed maul and "silver" spkes were used to reconnect Boulder City and Henderson by railroad during the Final Spike ceremony on Friday. The spike reconnecting the cities is just east of the new bridge over Interstate 11. 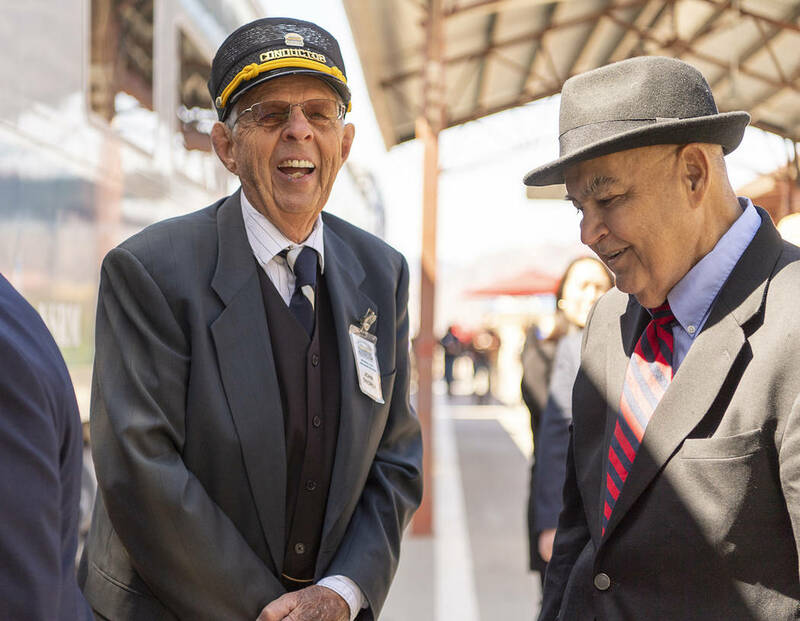 Mark Damon/Las Vegas News Bureau Conductor John Georgi, left, chats with passengers, including Councilman Warren Harhay, as they board the train for the Final Spike ceremony at the Nevada State Railroad Museum in Boulder City, which reconnected the Nevada Southern Railway between Boulder City and Henderson on Friday. Hali Bernstein Saylor/Boulder City Review Guests for the Final Spike ceremony to mark the reconnection of Boulder City and Henderson by railroad get ready to board a train at the Nevada State Railroad Museum in Boulder City for the trip to the site on Friday. 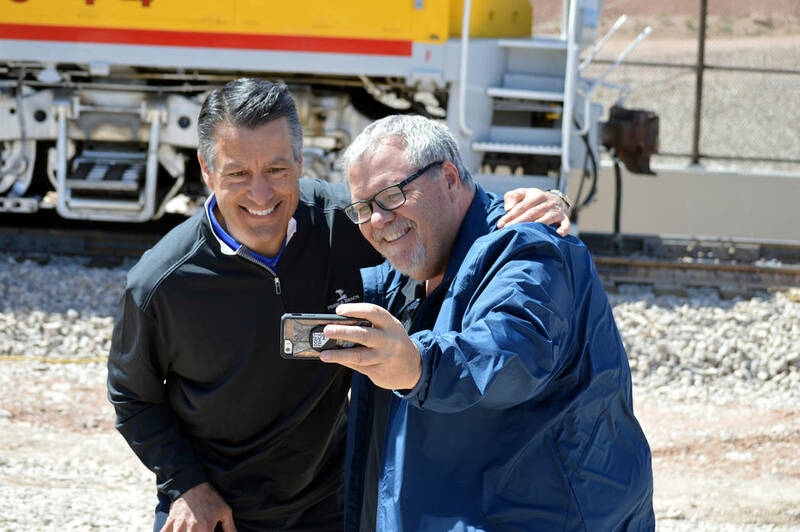 Celia Shortt Goodyear/Boulder City Review Local, state and federal officials enjoy time together and take time for a photo at The Final Spike - A Historic Reconnection on Friday, April 13, 2018, from left, Nevada Sen. Joe Hardy, Nevada Gov. 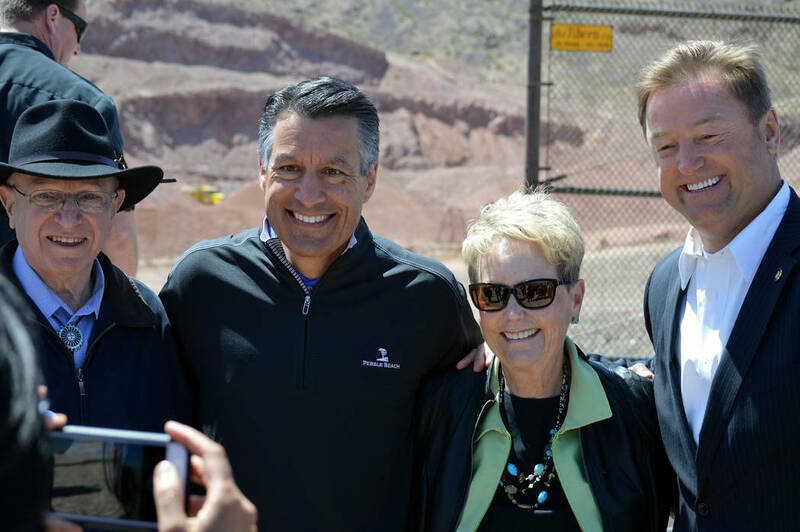 Brian Sandoval, Boulder City Councilwoman Peggy Leavitt, and United States Sen. Dean Heller. Celia Shortt Goodyear/Boulder City Review A Nevada Southern Railway locomotive travels over the Interstate 11 Railroad Bridge on Friday, April 13, during The Final Spike - A Historic Reconnection event reconnecting Boulder City to Henderson via railroad. Celia Shortt Goodyear/Boulder City Review Boulder City Chamber of Commerce CEO Jill Rowland-Lagan shares the importance of the railroad to Boulder City at The Final Spike - A Historic Reconnection on Friday, April 13, 2018. 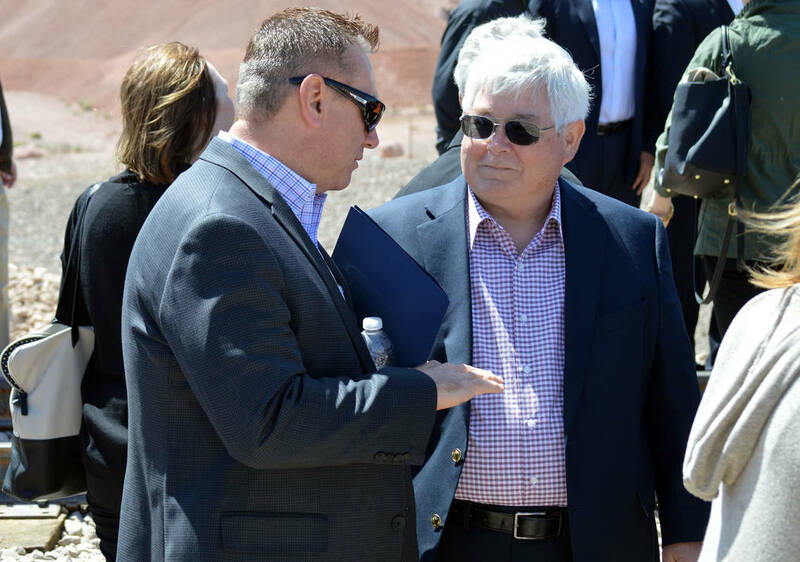 Celia Shortt Goodyear/Boulder City Review City Manager Al Noyola, left, and Boulder City Councilman Kiernan McManus chat during The Final Spike - A Historic Reconnection on Friday, April 13, 2018. 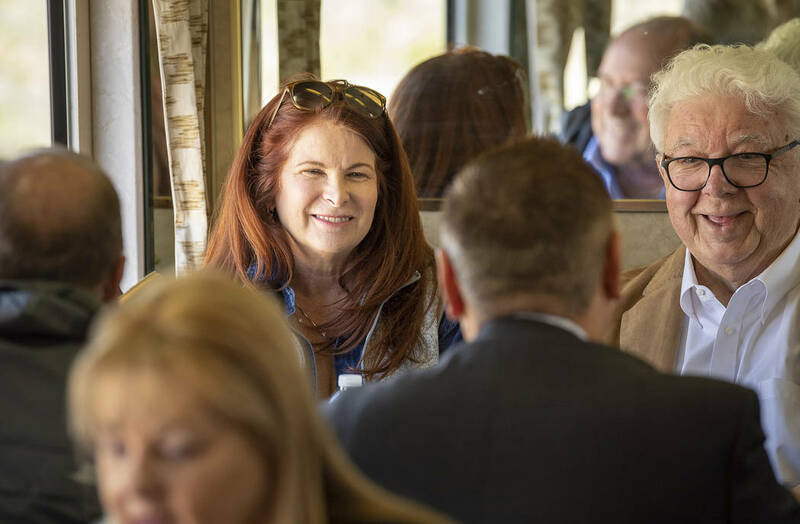 Mark Damon/Las Vegas News Bureau Henderson Mayor Debra March, left, and broadcaster and historian Bob Stoldal chat with friends on the train to the Final Spike Ceremony as the Nevada State Railroad Museum in Boulder City celebrated the reconnection of the Nevada Southern Railway between Boulder City and Henderson on Friday. Celia Shortt Goodyear/Boulder City Review Guy Clifton, public relations specialist for Nevada Tourism and Cultural Affairs, snaps a selfie with Nevada Gov. Brian Sandoval at The Final Spike - A Historic Reconnection on Friday, April 13, 2018. Mark Damon/Las Vegas News Bureau Peter Barton, administrator of the Nevada Division of Museums and History, describes the "silver" spike that was used to reconnect Boulder City and Henderson during the Final Spike ceremony on Friday. 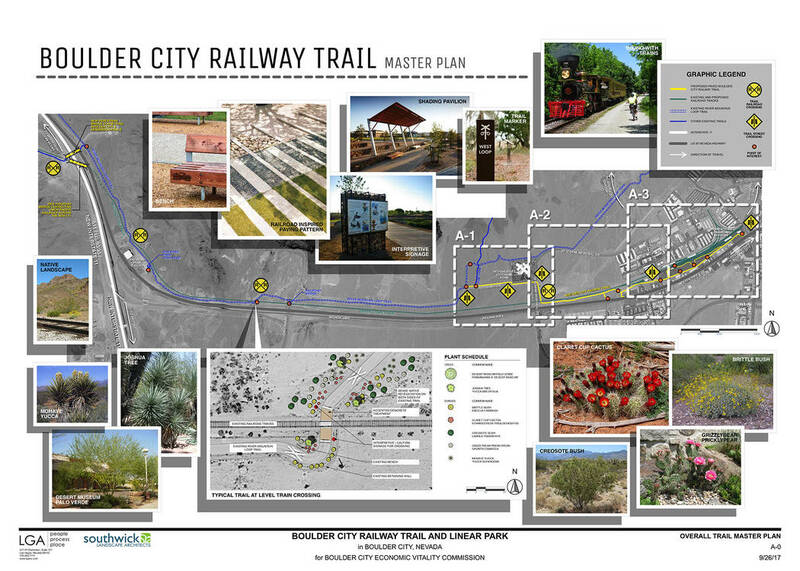 LGA Detailed plans for the Boulder City Railway Train and linear park connecting to the Nevada State Railroad Museum in Boulder City were showcased Friday, April 13, 2018, during the ceremony to reconnect Boulder City and Henderson by rail. 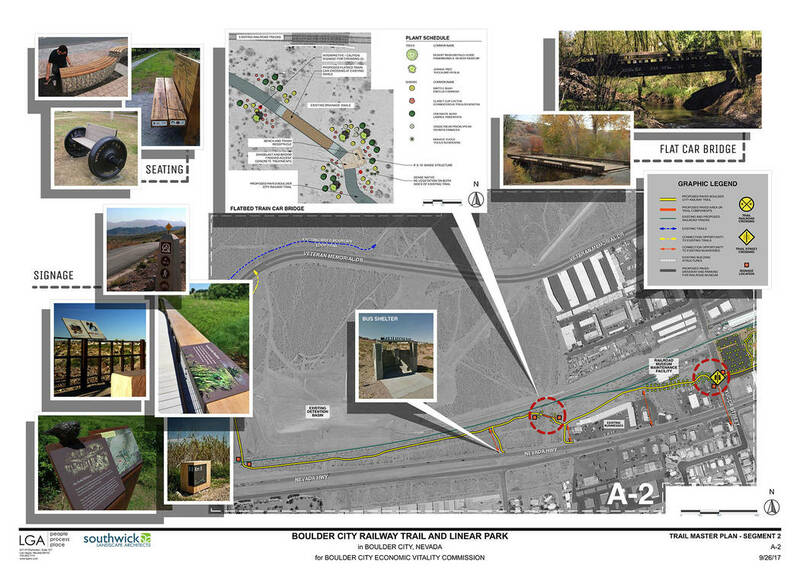 LGA Plans for the Boulder City Railway Train and linear park connecting to the Nevada State Railroad Museum in Boulder City were showcased Friday, April 13, 2018, during the ceremony to reconnect Boulder City and Henderson by rail. 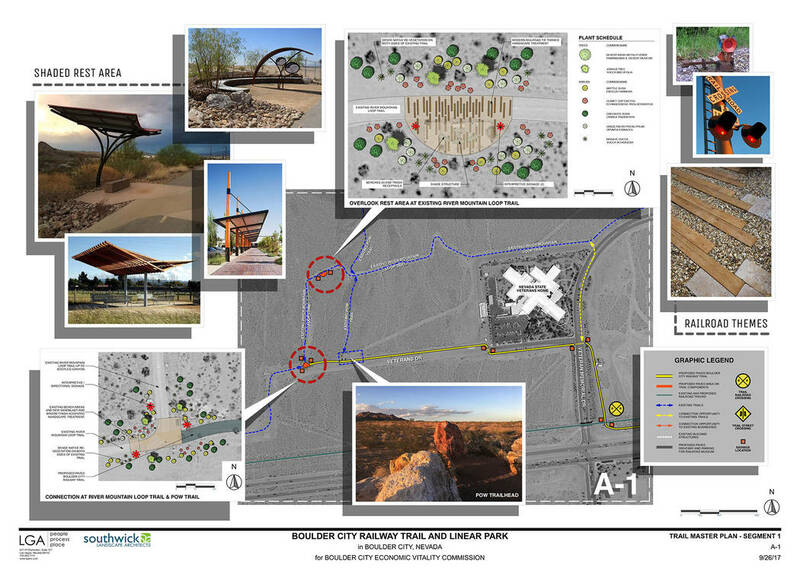 LGA The linear park to be built near the new Nevada State Railroad Museum in Boulder City were showcased Friday, April 13, 2018, during the ceremony to reconnect Boulder City and Henderson by rail. 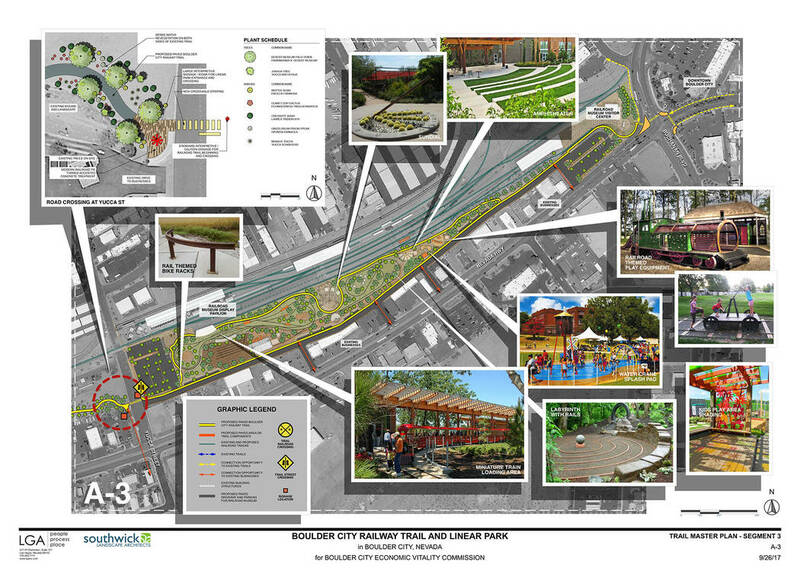 Proposed features for the include an educational component, railroad-themed play areas and a miniature train ride. 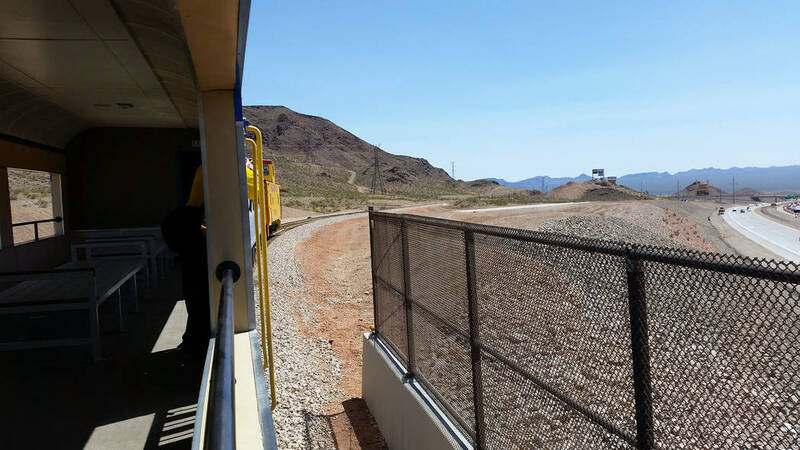 On Friday, April 13, the Interstate 11 bridge on the Nevada Southern Railway line opened near Railroad Pass. It allows the train to pass over I-11. Heller said that the day represented historical, cultural and recreational value and that trains are something people of all ages enjoy. In the 1930s, the railroad line was used to carry equipment and supplies to the Hoover Dam construction site. In 1985, that line was severed at Railroad Pass when Boulder Highway was widened, and that 4.5 miles of track remained isolated. Trains carrying tourists started running in 2002 when the Nevada State Railroad Museum opened in Boulder City. He said the connection will allow the museum’s train to travel a little farther down the track, with the ability to see the lights of Las Vegas, and bring new pieces to the facility on their own wheels, both aspects adding excitement and energy to the museum. Hees said the museum expects to receive a large industrial locomotive in the next six months and could also receive two mainline locomotives for its collection. Henderson Mayor Debra March agreed about the momentousness of the day. “What started as a railroad whistle stop has reconnected us to history,” she said, noting the museum’s significance to boosting tourism and promoting family fun. Greg Corbin, former director of the Nevada State Railroad museums in Boulder City and Carson City, has been working on reconnecting Boulder City and Henderson since 1993. Plans are in the works for construction of a new museum and depot near the corner of Boulder City Parkway and Buchanan Boulevard, along with a linear park with activities for children and educational components. The greater visibility will help raise the millions needed to complete the project. “Hopefully, with the governor out here, getting a firsthand look, the state will take greater interest in the project,” said Larry Bender of the Economic Vitality Commission, which is working with the Boulder City Chamber of Commerce to raise funds to get the new museum built. Corbin has been passionate about the reconnection project and said the most challenging part of it was getting all the government agencies involved to work together. Hees said he does not expect the ability to travel over the bridge into Henderson to affect the museum’s regularly scheduled train rides, and he hopes they will be able to offer special trains for events in either city. He said there’s also the possibility of using the train as a shuttle service for events on Water Street in Henderson, offering parking in Boulder City, because there are rails just 100 yards from downtown. 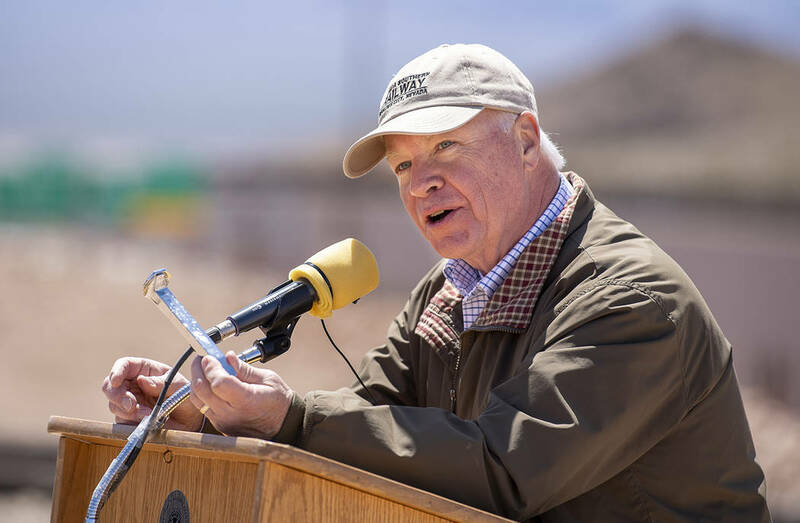 Peter Barton, administrator of the Nevada Division of Museums and History, sees the re-established connectivity also providing more recreational opportunities. He also said there is a desire to incorporate the train ride to destinations in Henderson.